Why is head protection important? Unfortunately, just like a portable computer, your brain is fragile and its packaging is not strong enough to protect it from all shocks or impacts. So, you need to choose appropriate protection for your brain and head. Head injury is still one of the most common causes of fatal injury in accidents. Choosing the right head protection, and then using it correctly, is not that difficult and will protect both your health and your wallet. This article gives an overview, including some of the aspects of head protection that are not so well known. The same principles of head protection apply wherever you are in the world, but I have used examples of European standards. As with any PPE, you can get detailed advice from manufacturers, suppliers and safety organizations and regulators; HSE in the UK 1 . Head protection in PPE terms is considered as protection against impact injury and some burn injuries. It generally protects the scalp area, and sometimes the jaw. The face is generally not included, except for some sports helmets. Eye and face protection, noise protection and respiratory protection are separate types of PPE. Protective clothing standards include protecting the head from chemical, biological and radioactive hazards. Head injuries can be very complicated - some are obvious when the accident happens but others appear hours or days after the accident. A head injury involves different kinds of damage to the skull and its contents. This may also include neck injuries. Different types of head injury often happen in one accident. Put very simply, the brain does not fill the skull - rather than being fixed firmly in place it “floats” inside the skull. Also, the brain and its blood vessels are soft, and can be damaged by contact with the inside of the skull and by being compressed or twisted. Obviously, if the skull is broken then the brain can be damaged by direct contact - an open head injury. But the brain can also be damaged without direct contact if it hits the inside of the skull, or is twisted on the top of the spinal cord - a closed head injury. For example, in a severe whiplash car accident there can be damage to the brain from being shaken against the skull, as well as neck injuries. Medical research has provided a lot of useful information on the types of head injuries occurring in accidents, and how these injuries are caused. However, because head injuries can be so complicated, the exact mechanisms that cause these injuries are still not clearly understood. When there is an impact to the head, there are accelerations and rotations of both the head and the brain inside the head. Research studies have defined the impact forces and accelerations which cause some types of head injury. These data come from a combination of accident and casualty data, and tests on cadavers, animals and volunteers. Because we are all different, our individual “head injury tolerances” are different. So, the forces and/or accelerations that are likely to cause head injuries are given as a range, and not as single values. As an example, the force to fracture the skull causing serious injury (and maybe death) is in the range 600 to 20000 N, with the typical force for a healthy 25 year old male likely to be around 3500 to 5000 N. Similarly, moderate or more severe concussion has been found to occur around 3000 N upward. Clearly, the important question here is what is an “acceptable” level of injury? I will return to this later. How does head protection reduce the level of the force/acceleration on the head? In simple terms, head protection will act like the crumple zone on your car. It absorbs some of the energy and spreads out the time of the impact. High speed video of a hard hat during impact shows the helmet looking very like a jelly - it wobbles and deforms, which absorbs energy. Of course, head protection must also be strong enough to protect the head from penetration. And, just like the crumple zone on your car, head protection should be replaced after an accident! Correct selection, use, care and maintenance is essential for you to get the best performance from your head protection. All head protection should come with full instructions, and the manufacturer or supplier can provide more information. You should always follow the manufacturer’s instructions. There may be other specific national regulations that require head protection. In the UK the Construction (Head Protection) Regulations 1989 and Docks Regulations 1988 both require suitable safety helmets to be worn where there is a foreseeable risk of injury to the head. Create exclusion areas where there is heavy lifting overhead Most importantly, remember that head protection does not offer 100% protection against all hazards - it only protects against defined hazards and only reduces injuries to an acceptable level. You may often see standards referred to, but do you know what they do? Comfort and wearability issues are not very well addressed in current standards. One of the major reasons for this is that it is very difficult to devise objective tests to measure such subjective factors. However, work continues to improve head protection standards ability to address comfort. For example, tests that would measure the ventilation of the head when wearing head protection are being researched, as this could be used as an indicator of likely thermal comfort for comparing head protection. As I said before, head injuries can be complicated, and the exact mechanisms that cause injuries are not understood. So, how do standards writers define test methods and performance requirements? All tests are conducted with the head protection mounted on an artificial test head. Penetration tests are easy - a sharp object hitting the head protection with a given energy must not touch the test head. Shock absorption tests are more difficult. A blunt object hits the head protection (on a test head) with a given energy. Different shapes of blunt object are used according to the likely hazard e.g. a kerbstone shape is used in some motorcycle helmet standards. For standards where a falling object is the main hazard, the object falls onto the head protection. For standards where the wearer falling over is the main hazard the head protection plus test head falls on the object. Either way, a limit needs to be set on the force/acceleration transmitted to the test head when the helmet is worn: this limit is intended to correspond to an acceptable level of injury. Setting this limit which is difficult, and requires the standards writers to use existing medical knowledge and experience of how head protection performs in use. At the moment, limits on the linear force or acceleration transmitted to the test head are used for shock absorption performance. What is an “acceptable” level of injury? This depends on what the injury would be without head protection. This emphasizes again that head protection does not offer 100% protection. And, for head protection just as for other PPE, increasing the level of protection means heavier and bulkier equipment which may make working difficult and introduce its own hazards such as thermal discomfort or musculo-skeletal problems. Why won’t head protection always protect me? Let’s consider some likely accidents. A brick drops from the second floor and hits a worker wearing an industrial safety helmet. If the brick weighs 1 kg and drops 5 m before impact then it has an energy of roughly 50 J. The helmet standard uses a 50 J impact for shock absorption, so the helmet should protect the worker from no worse than concussion and bruising - the intended acceptable injury. Replace the brick with a pallet of 50 bricks dropping from the same height. The impact energy is now about 2500 J. This is well above the energy used to test for shock absorption, so the helmet is no longer in its tested performance zone. The helmet will reduce the severity of the impact and the level of injury, but by an uncertain amount. If a 2500 J impact lasts 0.1 s then the force is roughly 5000 N. Without a helmet this is enough to fracture the skull causing severe injury or death. Even with the helmet this is likely to be a major injury, maybe still fatal. This is why you should create exclusion areas where there is heavy lifting overhead - head protection is not designed to protect against very heavy falling objects. Now consider a motorcycle accident where the rider is thrown off and hits a wall with their head so that their whole body weight is involved. This is the worst case for head impact and injury. At around just 6 mph, for an 80 kg rider the energy is roughly 5000 J. The best motorcycle helmet uses a 150 J impact for shock absorption. So, again, the helmet is no longer in its tested performance zone and will reduce the level of injury by an uncertain amount. Even with the helmet this is likely to be a major injury, maybe fatal. These figures are NOT a reason for not wearing a helmet, they just illustrate how large the forces on the head can be in a “minor” accident. Many accidents don’t involve the whole body weight, but only a proportion of it. Similarly, many impacts are not full on but glancing. So, even at higher speeds or higher nominal impact energies the helmet can be inside its performance zone, where its protection is known. And if the helmet is outside its performance zone it will still reduce the impact forces on the head. It is just that this reduction may not be big enough to prevent serious injury or death. If you mention head protection most people will think of hard hats or motorcycle helmets. But there are many other types of head protection. 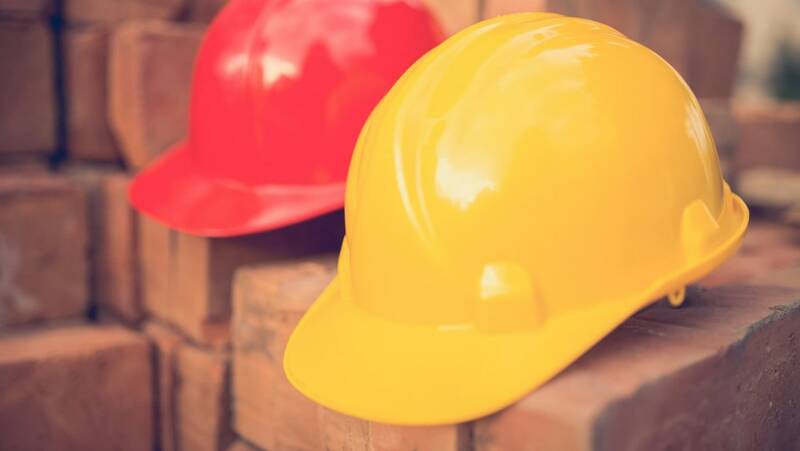 Although head protection can be conveniently split into industrial (or workplace) and leisure categories, leisure head protection is often used in the workplace. The emergency services and the military have their own head protection standards, but also use industrial and leisure head protection. Table 1 summarizes the protection offered by UK and European Standards. Bump caps offer low protection and are not intended to protect against falling or moving objects. They are suitable where the risk is walking into objects e.g. in warehouses and garages. Bump caps are available in both safety helmet and baseball cap styles. The baseball cap style is popular because it looks more stylish and is often more comfortable. This is another important factor in selecting head protection - if the wearers like it and find it comfortable they will wear it. Industrial safety helmets (the ubiquitous hard hat) offer medium protection against a range of hazards, with options for protection (e.g. electrical shock from brief contact with live wires, molten metal splash) that may be needed in some workplaces. They are suitable for a wide range of workplaces. Versions with reduced peaks are available to give better upward visibility. Some have ventilation holes to improve comfort - these holes must not affect the protection. Liners can be worn under the helmet in cold weather. Safety helmets must be able to fit an adjustable chinstrap. A chinstrap is very useful for keeping the helmet on your head, especially when you are bending a lot. It is a very good idea to supply helmets with chinstraps. There are regularly accidents where the injury is worse because the helmet had fallen off, or the wearer had got sick of the helmet falling off and had taken it off. The chinstrap is designed to release under a load. Although different products look very similar, they can feel different when worn because of different weight, centre of gravity etc. Sweatbands can make a helmet feel more comfortable. Industrial safety helmets are often used with other PPE, where it is very important that there is full compatibility. If the PPE or head protection does not fit properly because of the other PPE then it will not offer its full protection. There are many options for helmet mounted PPE e.g. ear defenders, visors etc. which avoid compatibility problems. The high performance industrial safety helmet is similar to the industrial safety helmet, but offers greater impact protection. The standard has none of the design restrictions of the industrial safety helmet (minimum helmet to head clearances etc). So, foam liners etc could be used if the protection performance is achieved. This is a recent standard so there aren’t many products available yet. The marine safety helmet uses a UK PAS, which is an agreed industry specification and not a full standard. It is a helmet specifically designed for users of small, fast craft such as lifeboat crews. The chinstrap is designed not to release. There are other standards which include industrial head protection. Some PPE ensemble standards may include their own requirements for aspects of head protection, although they may also reference head protection standards. There is also industrial PPE which uses the term “helmet” but is not strictly head protection. “Welding helmets” are generally faceshields/visors with a hood over the head. They are intended to protect the eyes and face against welding radiation and spatter and may not offer head protection. “Shotblasting helmets” are a form of hood intended to provide respiratory and abrasion protection. Protection against falling objects is optional (and uses test methods from BS EN 397). There is no British or European Standard for “ATV helmets” (ATV – all terrain vehicle or quad bike), “chainsaw helmets” or for “forestry helmets”. These are names for types of helmet that are CE approved either by technical file or by use of another Standard. Typically, ATV helmets are CE approved against some or all of BS EN 1384 (equestrian helmets). Chainsaw and forestry helmets are generally CE approved against some or all of BS EN 397 (industrial safety helmets). This means that there is no guarantee that different ATV helmets are directly comparable with other ATV helmets. Similarly, there is no guarantee that different chainsaw or forestry helmets are directly comparable with other chainsaw or forestry helmets. The manufacturer can supply details of how a helmet was CE approved. Why do some chinstraps release when a given force is applied? The intention is to reduce the risk of strangulation. If a helmet became caught so that the wearer hung by the chinstrap with their feet off the ground, a chinstrap which does not release might strangle them. But, it isn’t that simple. If a helmet is intended for accidents where there is more than one impact, then a releasing chinstrap might release the helmet early on and leave the head unprotected for later impacts. So, the balance of strangulation versus multiple impact risks has been considered when deciding whether a standard will have a releasing chinstrap. This is why the helmets where multiple impact is likely all have non-releasing chinstraps. This is the most frequent question that I am asked about head protection. The following comments apply to any helmet used as PPE, although they are written with the BS EN 397 industrial safety helmet in mind. I am not aware of any general legal or UK HSE requirements on specific replacement times. Some industries may have codes of practice or guidance which specify a given replacement time. Some workplaces/companies may have safety procedures which specify a given replacement time. A safety helmet should be replaced when or before its protective capacity has been significantly reduced. The manufacturer of the helmet is the source of guidance when deciding on a replacement policy. 3 years from manufacture is a widely accepted lifetime for helmets. This is a sensible “rule of thumb” lifetime, however, it is important that the user exercises some discretion. If the working or storage environment subjects the helmet to premature ageing it may be advisable to reduce the replacement time. Hostile environments include exposure to UV (including sunlight) and exposure to chemical attack (including vapour in the atmosphere). The manufacturer of the helmet will provide advice on environmental factors. If the helmet suffers an impact, it uses up some of its protective capacity and should be replaced, regardless of age. REPLACE THE WHOLE HELMET AND NOT JUST THE SHELL OR CRADLE. When a helmet has been exposed to regular small bangs and knocks, and is badly worn and scratched it should also be replaced. The best rule is “if in doubt, replace”. The date of manufacture will be found on the helmet as a permanent marking, as required by EN 397. It is usually given as a quarter and year, and is often on the bottom of the peak. This marking can take different forms e.g. dials with arrows, dots for the quarter and a year etc. Other head protection standards may also require manufacture date markings on the head protection. 1 HSE infoline 0845 345 0055, HSE website www.hse.gov.uk. 2 The Personal Protective Equipment at Work Regulations 1992 maintain the implementation of the Personal Protective Equipment at Work Directive 89/656/ EEC. HSE publication L25 “Personal protective equipment at work (Second Edition)” ISBN 0717661393 gives these regulations and associated guidance. 3 The Personal Protective Equipment Regulations 2002 (SI 2002 No. 1144) maintain the implementation of the Personal Protective Equipment Directive 89/686/EEC and are produced by DTI.